"I loved it all,the cut and thrust, all the larking about at the end, i love all that, when the gloves are off at the end i love it, when everyones kicking bits out of each other, moves are going in, in a crit it happens straight away, in a road race you have to be patient. Thats what i get a buzz out of, at the end of a race, the last lap, everyone starts racing, love it! Dave Williams story could so easily have been different, the product of a 1970s comprehensive education, with no interest in lessons it was easier to stare out of the window, there were plenty of distractions for a teenager growing up on Merseyside. Southport offered few opportunities,to say the bike saved him would be melodramatic but it did offer him another way to make his mark.
."I always used to go out on my bike after school, you know, cow horns, insulation tape, just mucking around, i did enjoy bikes. i started racing when i was a schoolboy, just a few pals really, one pal in particular, he was into his bikes and stuff i bought a bike off him a proper dropped handlebar bike, i was always mechanically interested and just starting racing on the back of that. I bought the bike myself, I lived with me mam, she was not as interested as i was, she probably though it was just a phase. I was that hooked on it the last few years in school i would go in, get my mark then go out cycling. The teachers may have cared but i certainly didn't I failed all my exams, went to college and failed them all again, i was very consistent but i had really got the cycling bug then". Williams forged a career racing as an amateur, a professional and back to amateur again through the British boom times of the mid eighties to the doldrums of the nineties. Prize money was good but the lottery funded, supported British Cycling pathway was not even a blueprint, you had to find your own way back then..
"Merseyside was very strong, i was rubbish to start with, very mediocre, i starting doing a few club 10s, deep down i hated them but i was actually quite good at them. I quickly progressed and was doing some reasonable times and road racing at weekends. we used to ride out and back it was the only way we could get to races, that and scrounge lifts. I started knocking around with Nigel Simpson as a second year junior, Nigel was very good, riding the Peter Buckley races, which I did not do, we travelled to the National championships together and there were all these names you had read in the comic, Chris Lillywhite, Peter Georgi, Bobby Holden.... Nigel won the race and i won the sprint for third place, i was absolutely over the moon, wow all these people i had been reading about and i had just snotted them all in the finish." Certainly no scholar but definitely a quick learner..
" I got my first win at Blackpool, it was a hotdog circuit, up and down the cones on the seafront, probably not a fantastic field, i hate coming out of dead turns so i took my chance, so, "he who dares Rodney", i finished up winning. once you realise that sometimes taking a chance pays off you are more inclined to do it. I was pretty strong i had a reasonable finish, who cares if you lose, you have to be prepared to lose to win." Claiming his dole money "£48 quid a fortnight signing on on a Thursday." Williams turned senior in 1984 and was starting to get noticed. Talking to Dave at the Primera Cycle Expo in Bournemouth was a trip into 1980s cycling history, the timeline, like the memory maybe a little hazy but that just adds to the nostalgia. Endless anecdotes liberally sprinkled with familiar names, all delivered in that pulling a fast one, soft scouse lilt made for an engaging, entertaining couple of hours, although it was hard to get a word in! "I had raced a lot in "85, the Kirby CC was very strong, myself, Nigel, Doug Dailey & John Cavannah went to Ireland and rode the Guinness 800, i think it was a week long race, i rode ok, stage racing really brought my form on and after that i won the Divisional champs, Merseyside was a really strong Division, that was a big win and one of my heroes, Mark Bell was watching. My first Star trophy race was over the North York moors, it finished on Redcar seafront, i forget the name of the race, Paul Curran and me ended up coming into the finish together, Paul i am sure would agree, is a cunning track rider and i was a bit gullible senior rider although on Merseyside we pride ourselves on winning at all costs even if it made you unpopular. i remember cussing Paul all the way on the run in to the finish, i tried jumping him but could not get rid of him, the writing was on the wall, so i though the threat of violence was my only option left, i explained to him if he even though about doing what he was thinking about doing he would have to suffer the consequences, of course he beat me in the sprint, it was a very valuable lesson. At the finish i remember jumping on top of him, probably Albert Hitchen, who was a national selector & Jim Hendry pulled me off him, i did not know who the hell they were. Once they had pulled me off Paul they said " You've done a really good ride and would i ride for Great Britain at a stage race the following week". I went from wanting to kill Paul to riding for GB. I would never say i was a talented bike rider because i am not but what i did do was work hard and would get back what i put in, i was more of a grafter, i put a lot into my training back then, what i lacked in talent i made up for in enthusiasm. Cyclists tend to fall into two categories; naturals & grafters, and grafters are not necessarily riders who graft during the race but graft during the week in training. I raced in Germany at the Rhineland-Pfalz, a stage race i remember, it was a tough race with Olaf Ludwig, the world amateur champion, eleven stages, Stephen Farrell was there, he was a good lad Steve, on one stage a break had gone up the road, i said to Steve " i gonna take a chance, do you fancy chipping across he said no but i went for it, we had a good lead on the finishing circuit and some of the guys were riding for the overall, no one knew who i was so i took off, no one followed and i won the stage. The guys who had just pulled me off Paul Curran then gave me the chance to go to Belgium for a four day race, to see if i could repeat the process. I had come out of nowhere now there was talk of me going to the amateur worlds, i had had no career as a junior, no real carer as a senior really. In Belgium it was the nucleus of what could be the Worlds team, me Dave Mann, Paul Watson......it was pouring with rain, i hate the rain, i see the Belgium national champion go up the road (Johan Capiot) so i chipped across to him, we were swapping turns on the finishing circuit, i was sat behind him and i could see the lights from the cars behind on the back of his calves, they were really close so i jumped him and won the stage, they had to take me to the worlds, i was 19, wasn't real that assed about going! 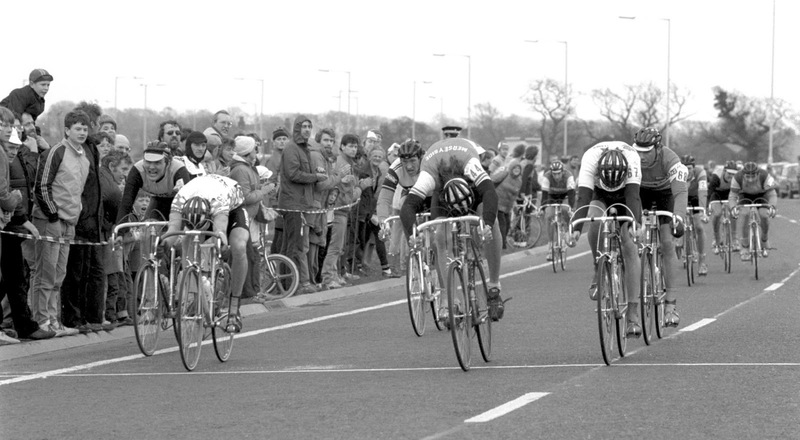 I was the youngest, me, Dave Mann, Tim Stevens & Pete Longbottom, we did ok in the team time trial, i cant remember where we finished but we finished respectably, 1.57 or something for 100km." "I had a message to ride the Tour of Normandy for GB, Chris Walker, Chris Lillywhite, Simon Cope, Cayn Theakston, i cant remember who else, i have seen a picture of us in these crazy old tracksuits, it pissed down i hated it. One good thing did come out of it though, the lads encouraged me to come back to the UK and ride for the Paragon team, with a view to turning pro the following year. The team was the most elite amateur team in the country at the time, we got a retainer, really good kit, Campag super record, Gazelle bikes, Santini clothing, a proper race programme. Some of the guys i was riding with were making a living at it, Dave Llloyd, Keith Reynolds,Alan Gornall, i was capable of doing it to, it was what i wanted to do, one hundred percent." Did he think of himself as a professional cyclist? 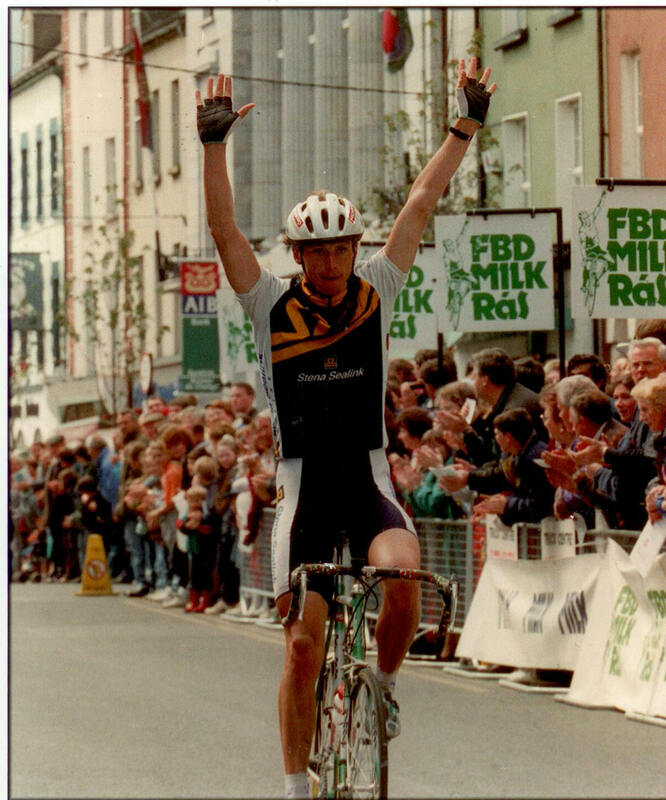 "I was full time but definitely an amateur, i was racing mostly against professionals, there was not much support, some tubs, maybe a Jersey from GB, that had to be given back but never did! but there was a really healthy amount of prize money, even an evening race it would be fifty,hundred quid for a win, primes, 20, 30, 50 quid, you could come away with 150 quid in your arse pocket on a Tuesday night, nice to top up your dole money. 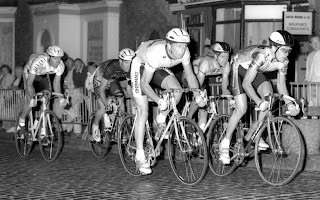 We did all the races in 1986, Kellogs tour of Britain, we were pretty wet behind the ears, we just did what we always did. I did not have a great year in '87 and i was getting a bit disillusioned i had no prospects of a contract and to be honest i was earning more as an amateur than some pros. I rode for a Dutch team called Zero in 88, we did most of the classics, Gent-Wevelgem, Amstell Gold, Liege-Bastonge-Liege, Flech-Wallone but we never got paid so i quit." Williams did not touch his bike for two years. "I went on the piss, labouring on a building site, i did not see the point, getting paid a piffling salary, mates i had gone to school with were buying houses and XR3's and all these lads who were professional athletes were getting paid peanuts. I grafted really hard, got some money together and bought a house." Along with Stephens,Roger Hammond, Jeremy Hunt & Chris Newton were all at the Great Yarmouth race, the names were getting younger? "All kids, i was an old hand by now"
An old hand who was still in demand! "Keith Reynolds offered me the chance to race for the Townsend team, i was flattered. I could get a lot of money as an amateur and i could race as much as i liked, as a pro you could only ride pro races,I really loved racing so i turned Keith down. 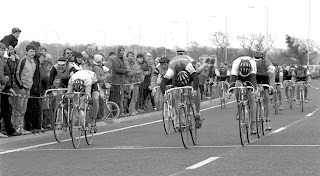 The following year 1996 racing had become Open and i got invited to ride for Team Ambrosia with Rod Ellingworth, Mark Mckay, Rob Hayles and Tim Hall.We rode really well, i won Girvan that year and the Eddie Soens. 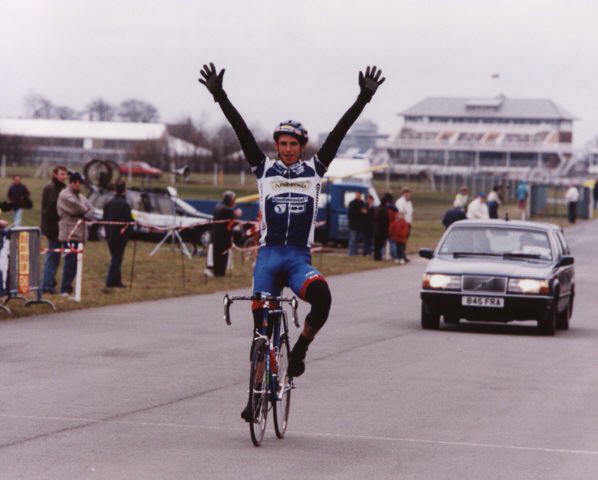 Eddie Soens is like the worlds for us up north and i won it twice. 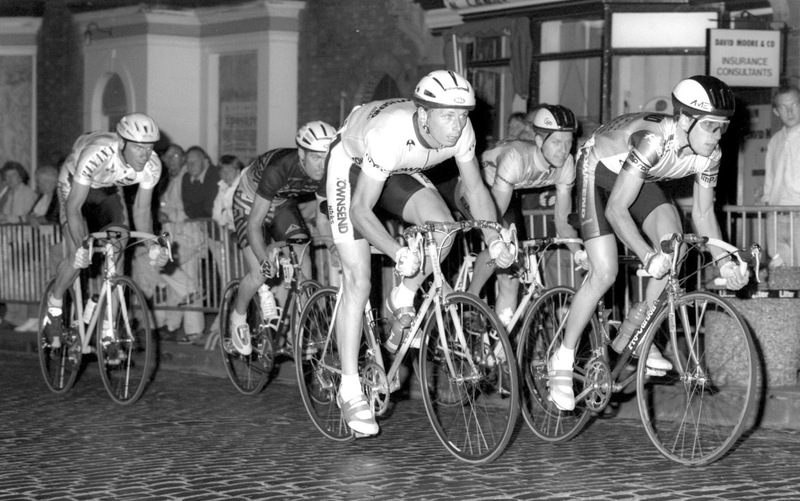 In 95 riding for RT Italia, i got in the break with all the Kodak team which was pretty much the team pursuit guys. I was a bit savvy by this stage and managed to get rid of all of them and snotted Julian Ramsbottom at the finish, i was really made up. In 96 it was me Rod Ellingworth & Glenn Holmes, who was riding for a dutch team and i left them both, i think Rod came in second." "Bradley was very very talented, i did not have too much respect for him, he was a young upstart, years later at a wedding he told me he won the support race at the Crit champs in Great Yarmouth and had looked up to me." "I was on the dole, i had all day everyday, we did not know what we were doing, we would just go out and mile eat, we got our quality miles from racing, back in those days we could race four or five times a week during the summer. There was no imput from GB. You were doing what your peer group did, if someone suggested doing a 20 minute interval we would have thought they were mad. We used to go out and ride three hours then ride a crit in the evening, we were knackering ourselves but everyone was doing it. I think modern training methods are good, look at British Cycling, we have gone from nothing to probably the best in the world, there is clearly a big effect. If you were serious you would not go out the night before a race, Pre race meal? a bag of chips, a marathon (snickers) and a can of coke." "It seems to be the track is a vehicle for the road but if you have not got a passion for the track... i think a lot of guys slip through the net....its a science, if you can provide this many watts for four minutes you get a medal, if you get a medal we get funding, if we get funding we can reinvest. Ultimately without the system we would not be in the strong position we are in but it has taken a bit of the romance out of it. You have to have a lot of respect for the guys who go abroad and make it outside of the system." " I never rode much track, went down to Leicester for a laugh, had a few beers and rode the track. Up for 10 minutes, sat down talking, up for another 10, it wasn't for me"
"Doing the Havant Grand Prix, all i can remember is, i hated it, it was red hot and dead hard, we had driven down on the day, i was nailed the whole day, i finished"
What about todays domestic race scene? "Terrible, yeah, the level of racing is high but the calendar is appalling now, there is not enough racing, a few premier calendars, the Tour series but what else is there? All the town centre races have gone, once a week on a Sunday and thats it and i dont envy the guys with all the traffic on the road." "I was a big diesel, i had a good sprint from a small group but not from a big bunch." 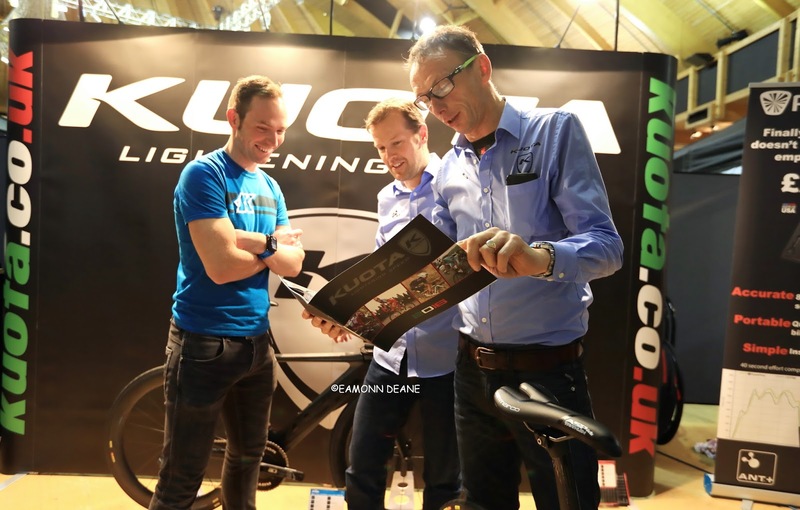 "I run my own business, Terry Dolan a good pal of mine introduced me to the Kuota brand, we assemble the bikes ,its grown and we do a lot of business with independant dealers like Primera. We also do Spinergy Wheels, GSG Clothing, and we have just started these new Powerpod Power Meters (the first meter to attach to the handlebars). I am sell something i am passionate about, i know the Kuota bikes inside out, i have ridden them all, if someone phones up with a problem, i can solve it, creaks, groans, which all carbon bikes have, i can solve it, i consider myself very knowledgeable . "I race TLI a lot, against all my old adversaries, its good, riding with blokes your own age is good, i like the BC races but lets be honest a fifty year old cant complete with 20 year old lads although i have won a couple of races." Do they know who Dave is? Most of them dont, i have to give them a bollocking, i just sit behind them and say "sorry i'm not working, i wouldnt have had the cheek to ask a fifty year old to work, its not a popularity contest, get rid of me! I am sitting here, get rid of me"! Dave Williams won over 100 races in his career.